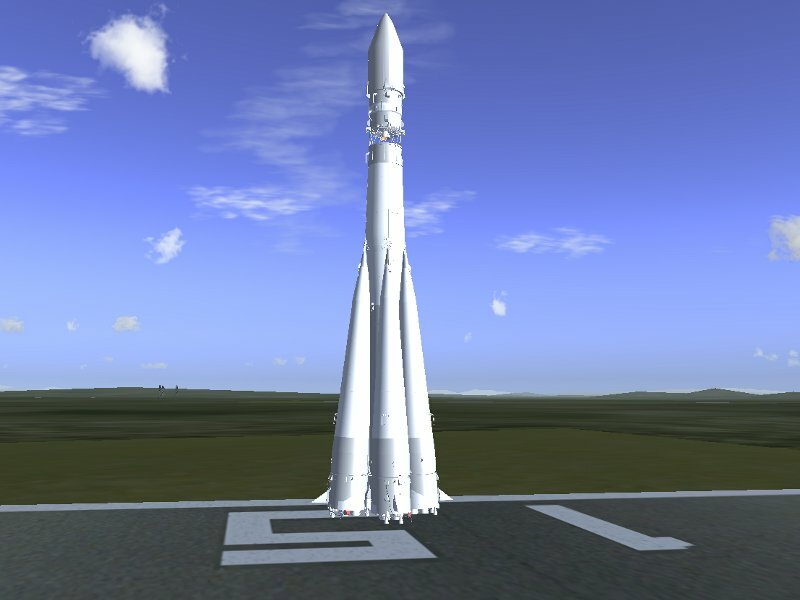 Posted on January 26, 2012 by Thorsten R.
What would it be like to fly a rocket into space? Do you want to earn your astronaut’s wings? Real spaceships aren’t actually piloted into orbit. The risk that a human being, strapped to his acceleration seat and under a crushing acceleration of 4 g for a prolonged period of time is unable to fly with the precision required to reach orbit is far too great, and real spacecraft reach orbit on autopilot. But what would it be like? Welcome to a scenario in which a Russian Vostok spacecraft has been acquired by the USA and fitted for a manually flown mission. This is the launch vehicle assembled at Edwards Airforce Base. The actual capsule is hidden under an aerodynamically formed protective cover. Below it is the third stage of the rocket, with its exhaust nozzle visible. All this is mounted on top of the huge first and second stage. Unlike many US rockets, which use sequentially burning stages, the first stage of the Vostok launch vehicle consists of four boosters which burn along with the long, cylindrical second stage. The inside of the spacecraft is a very small place. There are no big windows (and currently the protective cover blocks the view outside in any case), so there is not so much to see except the instruments. In front of me is the main instrument panel, and to the right is the stage control panel, left of it the control handle. 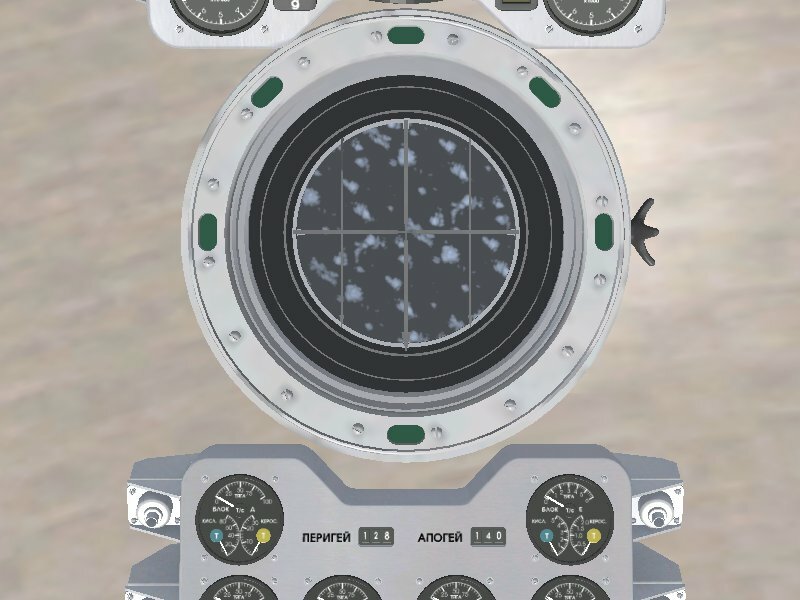 Here’s a closeup onto the main instrument panel. Since I won’t be able to see anything of the outside during much of the ascent and the descent, this is what I will have to navigate with. The most important instruments are in the lower half of the panel – altimeter, inertial speed indicator, vertical speed indicator, dynamical pressure, orientation and acceleration. This isn’t enough to fly with any precision, say to rendezvous with ISS – but that’s not what the Vostok is for, it’s made to carry a human into orbit and back, and this is what I will do. One of my most important aids however is a handwritten cue sheet which tells me roughly at what altitude, velocity and orientation the rocket should be at a given time. Without such reference, it is very hard to gauge whether the rocket is on a good ascent path or not. Unfortunately, the ‘not being able to see too much’ is also a technical limitation. 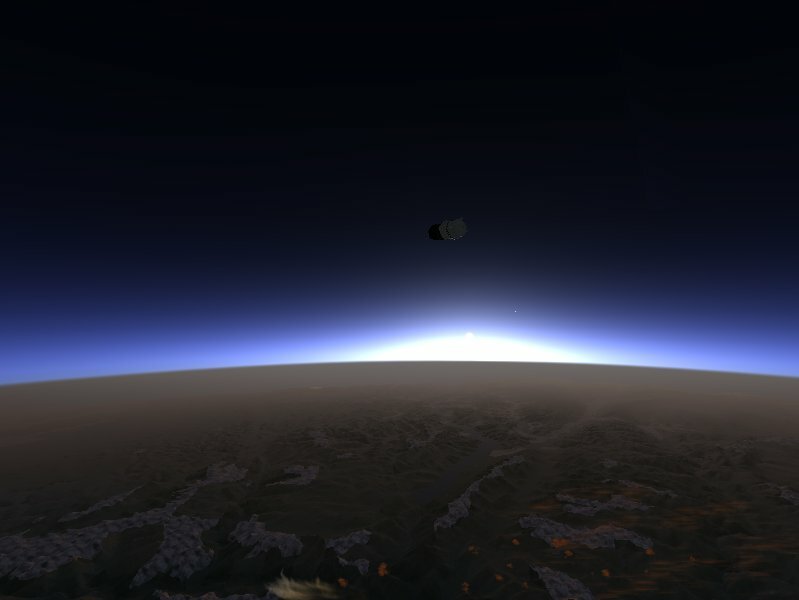 The Flightgear rendering engine is not designed to handle views from low Earth orbit, and even with the cutting edge development high altitude and extreme visibility rendering I’m using in the following, the view doesn’t really measure up to real views of Earth from orbit. After igniting the engine, the thrust takes a few seconds to ramp up, but the Vostok rocket delivers a solid 2 g initial thrust with first and second stage burning, so I lift off quickly. After the first few seconds, I rotate the rocket around its main axis such that I am facing my launch heading. 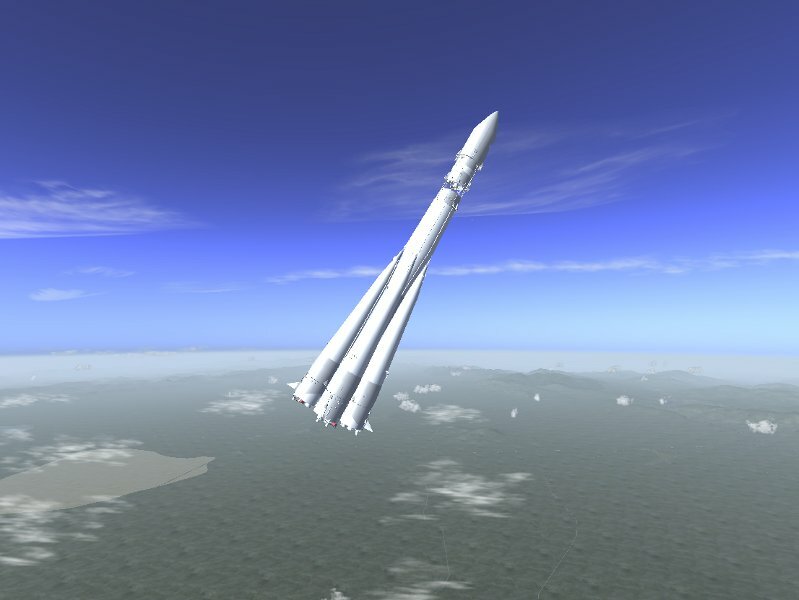 To make use of Earth’s rotation, launches are done eastward. As soon as I reach the desired heading, I push the ascent path out of the vertical along my launch vector to about 60 degrees with the horizon. 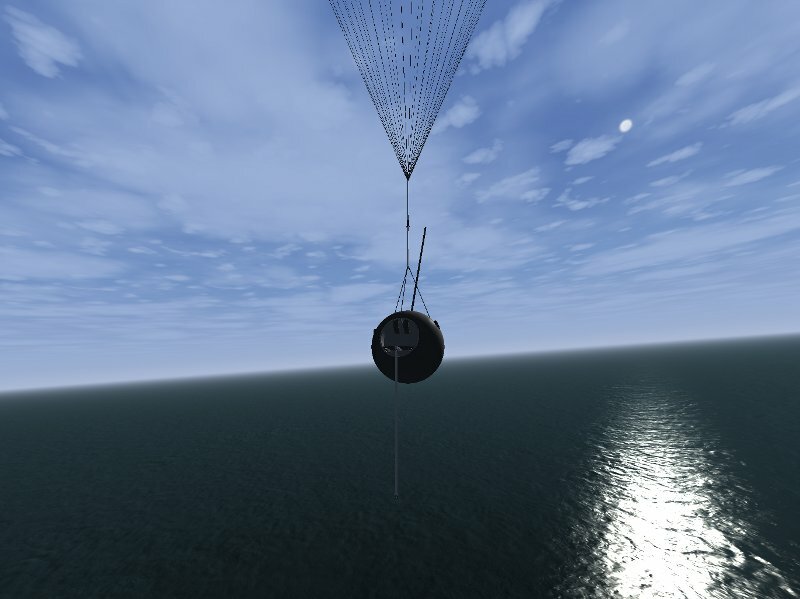 During ascent, I will thus be more and more hanging face-down in the capsule, facing Earth at all times. Which is very reasonable, because in case of any instrument malfunction, this gives me at least a rough visual reference. Of course, the actual forces in the capsule are nothing like hanging face-down, the acceleration always pushes me back into the seat. After passing about 20.000 ft, the dynamical pressure starts growing large, and I have to throttle back to avoid damage to the rocket. After all, a rocket is little more than a thin shell around fuel tanks: For instance, the second stage weighs roughly 100 tons at liftoff, but its empty weight is a bit over 7 tons. The air thins rapidly, however, and thus the dynamical pressure decreases quickly and I go to full thrust again. Once above the pressure peak, I push the nose of the rocket further down to 30 degrees with the horizon and start building up forward velocity while Edwards AFB vanishes below. The full power of the JSBSim flight dynamics and atmosphere model affects this part of the ascent, and so the interaction between rocket and atmosphere is as realistic as the available data on the Vostok can make it. After about 90 seconds, the fuel of the first stage boosters is almost spent, and the reduced mass of the launch vehicle ramps up the acceleration to 4 g and beyond. Once again, I throttle back to stay below 4 g to avoid damage to the rocket. At about 120 seconds, the first stage is out of fuel, and I separate the boosters. I am now high enough that air friction is negligible, and so I also blast the protective cover off the capsule and can take the first look outside (nothing much to see though). The second stage is still heavy at this point, and so the thrust goes back to about 2 g as we climb the 100 km altitude limit into space. The whole flight dynamics changes quite drastically during a mission from the initial launch vehicle to the re-entry of the capsule. Also the weight of spent fuel is a significant factor. All these effects are quite distinctly felt during ascent to orbit. At this stage, I have to start watching my ascent casefully. 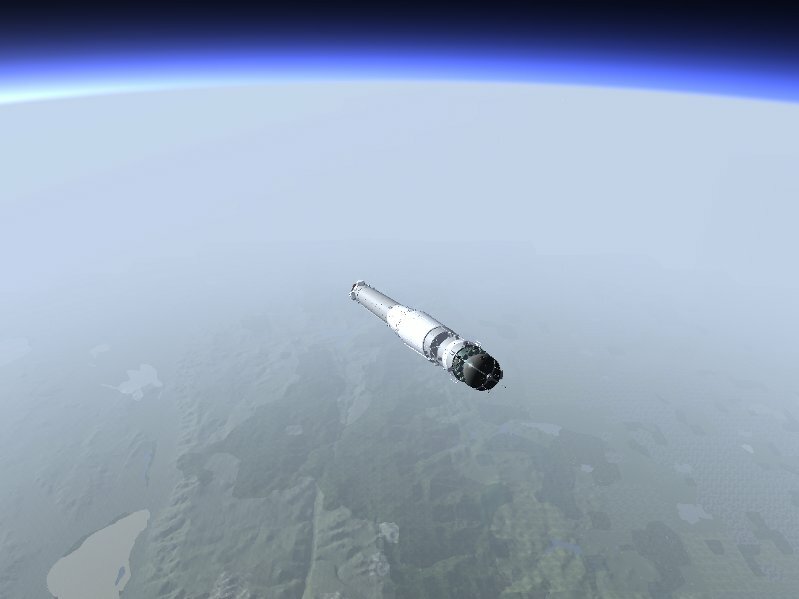 The second stage separation should bring me roughly to my orbital altitude with about zero vertical speed so that the third stage burn just keeps me at this altitude while accelerating me to orbital velocity of a bit more than 28.000 km/h. However, the second stage reaches more than 4 g thrust towards the end of its burn, while the third stage starts with barely 0.5 g thust, so any mistake I make at this stage will at best take very long to correct with the 3rd stage burn, at worst be unrecoverable. Thus, I control the pitch angle very carefully and monitor altitude and vertical speed. About 5 minutes after launch, the second stage burns out and I separate it as well and ignite the third stage. Flying a rocket is very different from flying an airplane – while an airplane reacts to its immediate surroundings and doesn’t remember much of what was five minutes ago, the rocket’s current state is pretty much determined by what happened the last five minutes. If the ascent to this stage was bad, there’s nothing much I can do to correct it now. But my altitude and speed after 2nd stafe separation are within reasonable parameters, and so I continue build up speed while keeping my altitude with the half g thrust the third stage provides. Another five minutes later, close to reaching orbital velocity, I have to throttle down. The speed must be reached quite accurately, otherwise I might go into an elliptical orbit rather than an almost circular orbit. And this is problematic, because the TDU has even less thrust than the 3rd stage, so if the 3rd stage brings me too high, I might not be able to de-orbit at all. There are also technical reasons – Flightgear currently isn’t designed to handle an altitude above 150 km, so I have to reach an orbit below 150 km and above 100 km where the atmosphere is thin enough. I watch the perigee indicator carefully, and as it starts rapidly climbing, I separate the 3rd stage – I am in orbit! Apogee and perigee indicators read 128 km and 140 km, so while not completely circular, this is reasonably good. 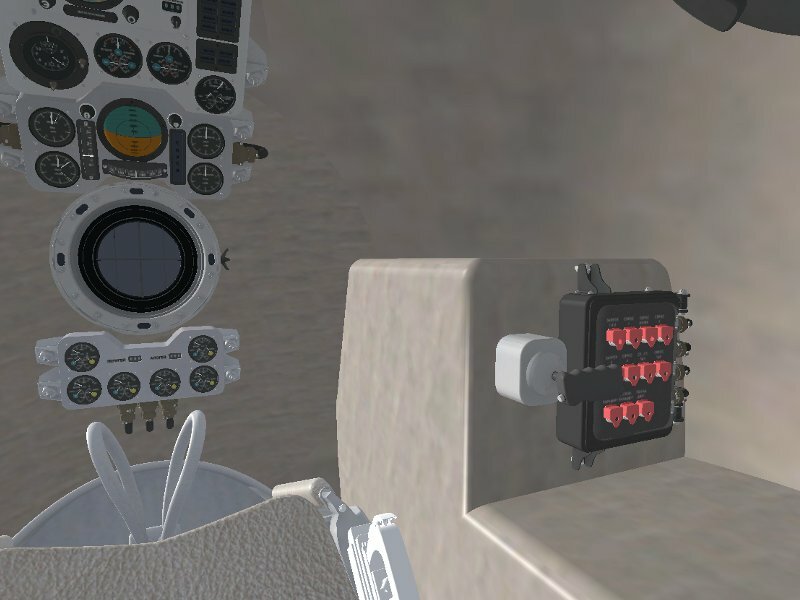 Flying to this stage isn’t easy – only three Flightgear pilots have to my knowledge reached a stable orbit with the Vostok spacecraft. You have to work for your astronaut’s wings! From this point, I only have the minimal thrust of the TDU available to turn the spacecraft and decelerate. Rather than aerodynamical controls, I now have to fire thrusters to change my attitude, so the spacecraft handles once again completely different. JSBSim handles the attitude control thrusters just as well as the aerodynamical controls, and the spacecraft handles again very plausibly at this stage of the mission. There’s not much to do while drifting along in the orbit. Look out and watching the sunrise is nice though. The cutting-edge development experimental lightfield shader brings out the Earth shadow moving across the terrain, the stark shadows in low light and the differential light dependent on altitude very nicely. 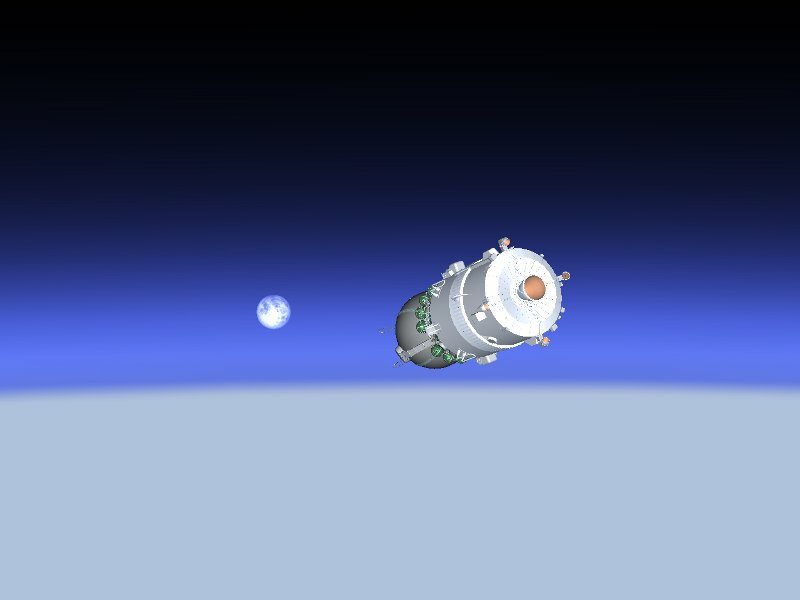 To de-orbit, I turn the spacecraft around and fire the TDU main engine to use up the remaining fuel. This lower my perigee such that it intersects with the atmosphere – the friction will have to take care of the rest. Then I separate the TDU as well. At first, the first gentle touches of the atmosphere lead to a tumbling motion of the capsule, this then stabilizes as the drag increases, and I start falling faster and faster. If you though the 4 g during ascent where tough, then you haven’t experienced re-entry yet. 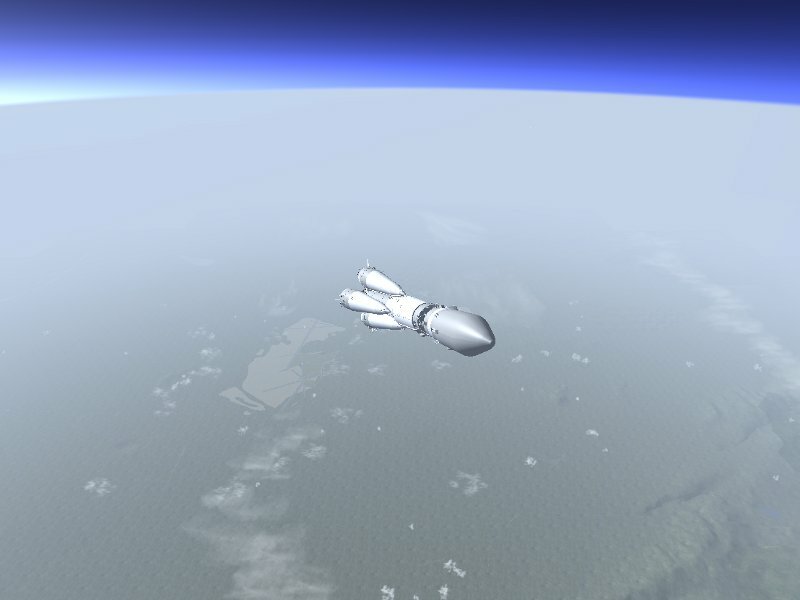 As the capsule finally reaches the lower atmosphere, a deceleration force of 8 g and more brutally brings me from orbital speed to a few hundred km/h. I simply black out during this stage. Flightgear optionally simulates blackout and redout due to extreme acceleration at set limits. By the time I get conscious again, I have an altitude of about 10 km and most of the speed is gone. Time to get the brake parachute out and kill the rest of the forward motion. After the braking parachute has done its job, I get the main parachute out, and once my vertical motion has slowed down, the final task is to activate the soft landing sensor. Looking forward to your development work on graphics with the other devs. I only have about 10% of the world scenery installed, and being unable to control my re-entry precisely, I hit a spot for the photo shooting which was not covered by my installed scenery and hence shown as water – no big mystery here 🙂 (I usually fly the events just as described in the story, but the photo-shooting doesn’t always work out and the screenshots often are from different runs). iv been trying this EXACT same thing but when i start to lower the thrust it starts spinning left then right and it does that even faster until the game crashes i think it might be a glitch pleaas help me on this!! a video of how to fly this thing on youtube would be awesome! I don’t get it. Why is the Earth dark? Since I have no clue what version of Flightgear you’re running with what options at what time, I can’t really tell. This is brilliant, however Orbiter is clearly the place to go for space mechanics. The basic simulation is currently being seperated from the rendering, so, in theory Orbiter being a part of the windows world is more and more reduced to the rendering client. A combination of both to one huge world would be just brilliant. Imagine you had a small simulation machine running and could connect to it with a graphical client. 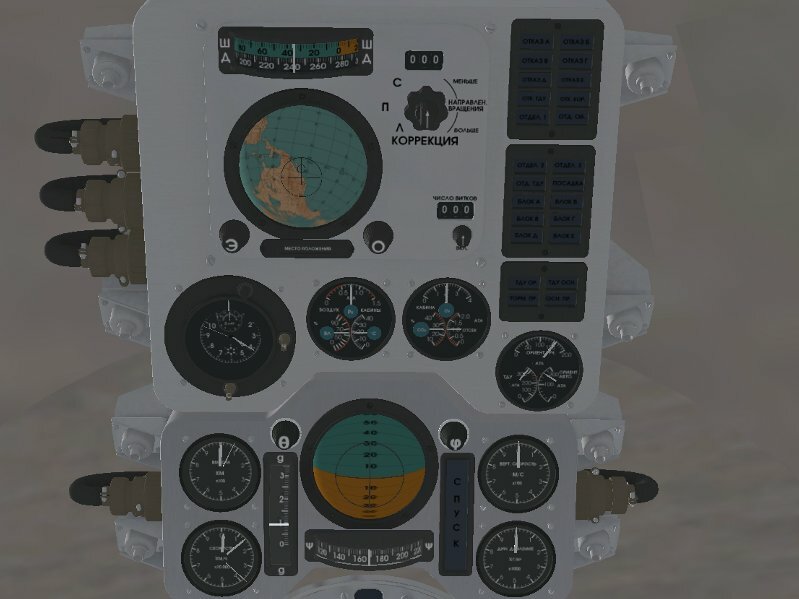 You could start a flight to moon in real time on a multiplayer server, your simulation machine would control for days and you would jump into the cockpit for the critical and fun stuff. Since I have seen Orbiter mentioned a few times in various places (at times with a condescending grin ‘Why do you bother doing this in Flightgear – we have Orbiter already and it’s so much better.’), maybe I should also comment on that. I am very familiar with Orbiter, and I have spent considerable time with it, including a trip to the Jupiter moons, deep-space slingshot maneuvers and aerobraking. First, the argument that there is Orbiter is a bit odd as such – there is X-Plane, and still we’re developing Flightgear. There is Windows, and still people bother developing Linux. A bit of choice is never a bad thing. Second, while Orbiter is free, it is very much part of the Windows world, while I am (as many Flightgear pilots) a Linux person. Also, free software isn’t GPL compatible software, and I happen to believe in the GPL concept. Third, I am very impressed by Orbiter’s visuals and by the orbital dynamics. There’s no question that hires Earth imagery is better than what the Flightgear rendering engine can provide at high altitude. But I am less than impressed by the atmospheric flight dynamics of Orbiter. What I have seen in Orbiter is rather far from what a flight dynamics model like JSBSim can deliver. 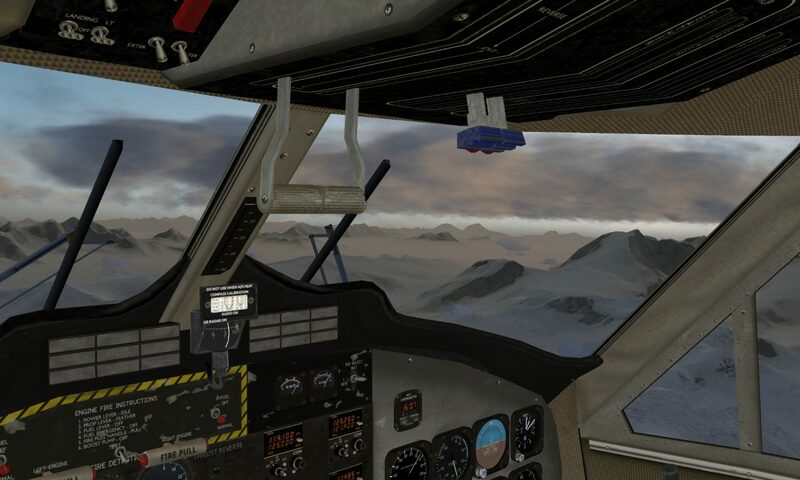 Thus, I have the impression that ascent and descent is actually handled more realistic by Flightgear, and that the fact that you can do something in Orbiter doesn’t imply that it works in Flightgear (or in reality). Fourth, Flightgear has a well-developed planet. You have the freedom to try your X-15 in the Himalaya if you like, and there will be actual mountains around when you get down. Below an altitude of 60.000 ft, the Flightgear rendering engine is in my view superior to what Orbiter can do, and that’s very much relevant for spaceplanes like the X-15 or Spaceship-1 which spend a lot of time below that altitude. wow the lightfield shader look awsome, is that using git or 2.6?. can’t wait to try. I hope we have it integrated with the rest in a nice way by the time 2.8 is released in half a year from now. Also, note that the performance consumption is really staggering – you need a lot of memory and a good GPU to render orbital views. There are some plans to improve here as well. As I said – this is mostly experimental stuff, just exploring what we can do and where we need to improve. can you share the cue sheet or where i can get them? What’s wrong with the launch instructions coming with the spacecraft documentation? Combine this with the burn times of the various stages and you can set up a timer and record what your parameters should be at given time for instance. Also, there is at least some room for errors – I once had a wobbly ascent which took me to 140 km altitude too early, then I fell back to 110 km, but I still managed a 120 – 150 km orbit in the end. that is the same as my problem here too high too early and got descent lamp on, and then I decided to abort the mission. Now I know that in that case it still can be fixed, I just worry too much. This is magnificent. Thorsten has done a wonderful job improving the planet.